How to install Cydia for iOS 8.4 - 8.1.3 with TaiG jailbreak? 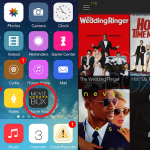 Home › Cydia iOS 8.4 › How to install Cydia for iOS 8.4 – 8.1.3 with TaiG jailbreak? This is the complete tutorial for Windows users how to jailbreak iOS 8.4 using untethered TaiG jailbreak. All iPhone, iPad or iPod devices are running iOS 8.4 – iOS 8.1.3 welcome to jailbreak & install Cydia with simple steps. just follow the instructions are given below to success..
How to install Cydia for iOS 8.4 – 8.1.3 with TaiG jailbreak on Mac? 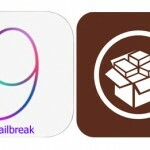 How to install Cydia for iOS 8.4 – 8.1.3 with PP jailbreak on Mac? Please fully backup your data before jailbreak. Disable Anti-virus programs on your iDevice as well as the computer. How to jailbreak iOS 8.4 – 8.1.3 with TaiG ? Step 02 >> Download latest version of TaiG jailbreak tool on your computer from above links & extract. Step 03 >> Connect your iOS device to computer with USB cable. Step 04 >> Right click on the extracted file & select “Run as administrator” for launch the program. Step 05 >> Then, the Program will detect your device & shows your device’s firmware on the window. Uncheck the “3K Assistant 2.3.0″ check-box to prevent installing Chinese app store. Step 06 >> Click “Start” to begin jailbreak. Keep your device well connected and wait patiently. Just ignore If you see storage full errors. Step 07 >> Once the jailbreak completes, you will be shown “jailbreak succeeded” massage. Congratulation! all are done without any errors. Then, your idevice will reboot and you can see Cydia app on your Homescreen. How to Fix iOS 8.4 / 8.3 TaiG jailbreak errors? How to Fix iOS 8.3 TaiG jailbreak errors? TaiG jailbreak for iOS 8.3 / 8.2 / 8.1.3 released..! Use TaiG 2.2.0 for JB 8.4 devices, Follow our instructions properly. Yayyy!!!! I can install cydia!!!!! Which iTunes do I need for this ? What is your matter ? But taiG jailbreak tool could not find my divice or my drive. and so 11 times in a row with different firmware on different computers with different cords. I have iphone5,i cannot install TaiGJBreak_EN_2200.exe. Itune is alredy installed in my pc. Follow instructions to jailbreak your device. What is your error ? Are you using latest version – TaiG 2.3.0 ? i tried to jailbreak an iPhone 5, and it gets to 60% and is trying to restart the idevice, but the device won’t respond and won’t restart. but when i tried the iPhone 5c it all worked fine. I did the jailbreak for 8.4 on my iPhone 5c and it worked perfectly. Then I tried to do it on my iPhone 5 and it’s not working I get the 1105 error and I disable the antivirus, defender and turn off the “Find My iPhone” but it still doesn’t work. It gets stuck on 60% and does restart the phone and/or it fails after injection. How do I get cydia without jailbreak? It is impossible. Without jailbreak you can get something like only Cydia demo. If you want real working Cydia, there is no any other way unless jailbreaking. What’s your problem? We can help you. Cydia now can get all idevices running any iOS versions. I am not able to install CYdia on my Iphone5s even though i have downloaded the link and tried to run as Admin but it says to install latest itunes though i have the latest one. Please advise. Pls carrier unlock before use jailbreak tools. Pls disable Antivirus, Firewalls, Turn Off Find my iPhone. Reboot your device and machine, Then use TaiG 2.3.1 to jailbreak your device again. 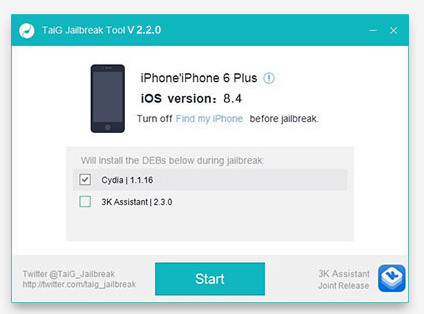 Are you using latest jailbreak tool version – TaiG 2.4.1 ? Hello, I tried install jailbreak 2.3.0 and 2.4.1 but my device wasn’t found. Im using the latest version of itunes an windows 7. I followed steps do disable codes, antivirus an find location……so what could be a problem? Try with a different computer..
Apple driver hasn’t been found. Please download and install iTunes. Please use TaiG jb too. This will install Cydia while jailbreak process is running. where is the link for taig? TaiG download link is on the middle of the article. Please don’t forget, you only can download TaiG using a computer & cannot download it with your iOS device. I jailbreaked my ios8.4 ipad2 with TaiG 2.4.3 and got a final ‘Jailbreak Succeeded’ message, BUT… there is NO Cydia icon !!! … still NO Cydia icon …!!! I tried another TaiG 2.4.3-session and got again ‘Jailbreak Succeeded’-message but still nothing ! Jailbreak = OK, but … NO CYDIA !!! I still find it hard to install an installer in my iPad . Please assist. Thanks. Ok. We’ll help you, what is your problem? During the jailbreak process Cydia will automatically install on your computer. Therefore you just only follow proper jailbreak procedure to get Cydia on your device. Select iOS version — > Download tool to jailbreak & install Cydia (Follow our guides). What is your jailbreak error ? successful jailbreak, but no Cydia icon. Help! How i can do mods eh? Pls Jailbreak device and get Cydia. Download latest tool and follow our blog complete guides compatible with your device. Jailbreak succeeded with TaiG 2.4.1 but no Cydio icon. What’s happening? I recently jailbreak my iphone 4s using TaiG and jailbreak succeded, but when i open cydia it says like, cydia will exit when it will complete ( not the exact words but alike meanings), and after that every icons of every apps expect cydia and 2 games disappeared, dont know what happend to it, its now like a useless phone because no phone settings messaging icons so nothing…..please help me out how can i fix it…. The TaiG jailbreak application keeps saying that iTunes isnt installed and I already have Itunes. What do I do??? is blacklisted iphone 5s ios 8.3 can be jailbreak just only for use as an ipod. my iPAD2 is already JB but it is in version IOS8.1.2. If I update to IOS8.4 and JB, will I have to reinstall all Cydia programs? Is there a way to overcome this? Yes, iOS update will lose your jailbreak. What happens if i don’t backup my data? hey its showing that the entry point cannot be located. what should I do?